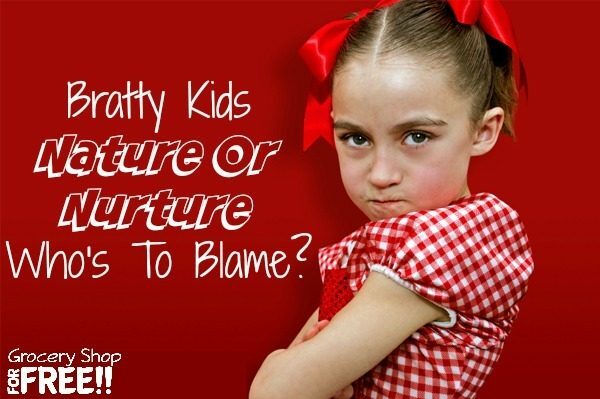 Bratty Kids Is It Nature Or Nurture? Who's To Blame? You are here: Home / Family Living / Parenting / Bratty Kids Is It Nature Or Nurture? Who’s To Blame? Bratty Kids Is It Nature Or Nurture? Who’s To Blame? We have had this discussion in our own family and it gets me a bit upset. There is one child in our family who has been called a “brat” more than once, and I have had this discussion with the people who have said it and with the mother of the child. Are kids born brats? Are they born with a propensity toward rude behavior? Well, here we go, this is my blog and you are here so, I get to say how I really feel, right? I don’t think there’s such a thing as a “bad” kid. I never have. Kids are molded by their parents, siblings, experiences, and environment. We as parents, though, are the ones who are provided to them to help them navigate it all. So, when I hear someone call a kid a brat, I think it’s unfair to the kid – they didn’t raise themselves, they didn’t teach themselves how to respond to people and situations. Their parents either did or didn’t. When people call an innocent child a brat, is it because they are too afraid to ask the parents why they raised a brat? If so, then don’t say anything at all. It’s not in any way beneficial to child or parent to call a child a brat. The parent is molding that child or they are just letting the child get older under their roof, which is a whole other problem, too! How exactly do we expect a child of 5, 6, 7 or even older to learn to not be a brat on their own? I think we all look at what we had or didn’t have growing up and decided how we would be as adults or parents based on that sometimes skewed view. If we grew up poor, some vow never to let their kids grow up poor. If we grew up being verbally abused we determine that will never happen to our kids. Those are bad things to decide, but, too often I see people throwing the baby out with the bathwater. They go too far the other way. We went from Leave It To Beaver parents in the 50’s to Flower Power parents in the 60’s and 70’s! That’s a huge shift, middle ground is not a bad thing. We can be their parents and not their friends. I love all of my children and loved laughing and joking and having a good time. I have tp’ed a friend’s house with them, I have taken pictures as they jumped off the roof onto the trampoline (I know, I know sometimes it’s hindsight..), but, I also corrected them when they needed it and taught them to be respectful to others. There are lines and a middle ground – it doesn’t have to be Father Knows Best or living on a commune, there is a middle ground. Next time you think of calling a child a brat, even under your breath, take a moment to remember they didn’t make themselves that way, it’s not their fault. When they become a teen or young adult their struggle to fix those things will be much harder than if their parents had just done it when they were young. Please don’t get upset and tell me that some kids have disorders that cause this behavior, I am obviously not talking about those situations. But, not every kid that is deemed a brat has a disorder.